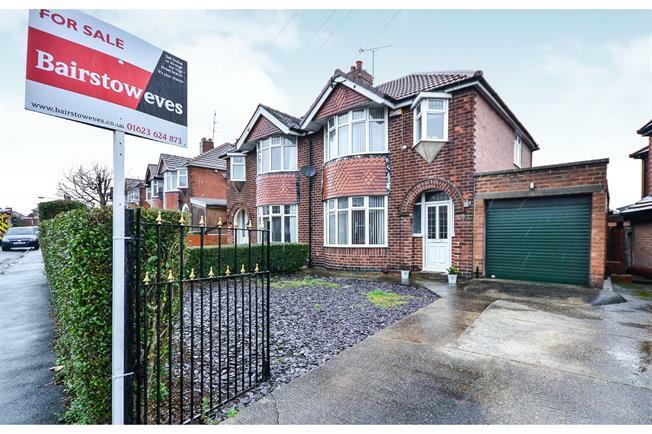 3 Bedroom Semi Detached House For Sale in Mansfield for Asking Price £155,000. SEMI-DETACHED HOUSE . . . EXTENDED KITCHEN . . . LOUNGE-DINER . . . NO UPWARD CHAIN . . . DRIVEWAY AND GARAGE. The accommodation comprises entrance hallway, open plan lounge-diner and extended kitchen. To the first floor there are three bedrooms and the family bathroom. Outside of the property are well maintained front and rear gardens with a driveway and garage. The property further benefits form gas central heating and UPVC double glazing. A UPVC double glazed door gives access with stairs to the first floor, radiator and doors to accommodation. With a double glazed bay window to the front, sliding patio doors to the rear and radiators. The extended kitchen comprises a range of wall and base mounted units with roll top work surfaces over, one and a half bowl sink with drainer and integrated double oven, hob and extractor fan. There are double glazed windows to the side and a double glazed back door. With a double glazed window to the side and doors to accommodation. With a double glazed window to the front and a radiator. Double glazed window facing the rear and a radiator. Built in storage cupboards. The three piece suite comprises a low level WC, corner bath and a pedestal sink. There is a double glazed window to the rear and a radiator.